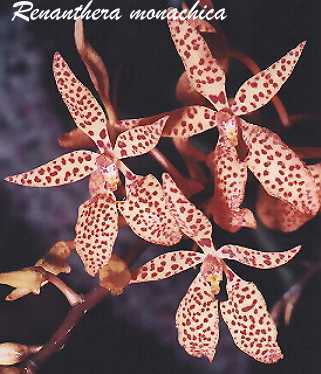 SITE LAST UPDATED 1/20/98 This Site Dedicated to Orchid Lovers Everywhere! SUBFAMILY Epidendrodeae, TRIBE Vandeae, SUBTRIBE Aerangidinae. 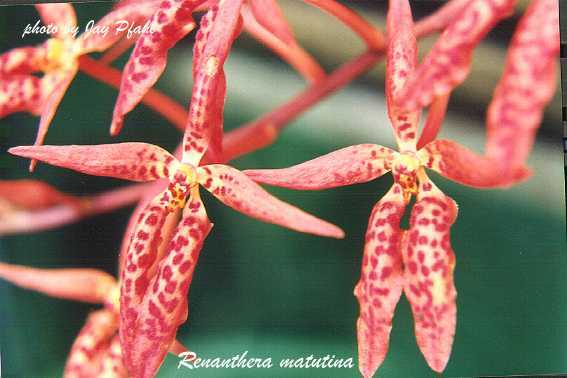 This genus is comprised of some 15 species from SE Asia to the Philippines. They are best grown in wood slat baskets and as a rule like partial to full sun and unlike Vanda less water and fertilizer after blooming. Otherwize their growing habit is very much like Vanda.